Rooms 202, 203 and 204 are separated by air walls that can be taken down and put back with ease. 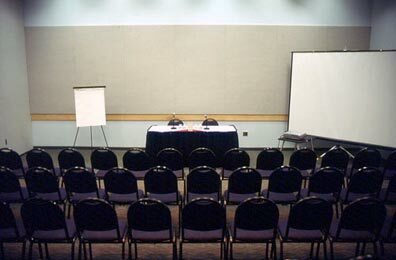 The three spaces have often been used as one large room, providing nearly 2,400 square feet of space -- by far the largest meeting room available on the Expo Center campus. The flexibility to expand space means Rooms D202-204 have been used several ways: as a classroom, banquet space, retreat venue, meeting hall and more. Users include the City of Portland, Oregon State Marine Board, Pacific Northwest Sportsmen's Show, and Northwest Quilting Expo.